The written content of this site, including the blog, may be shared, quoted, and/or re-blogged with clear attribution given to “The Ex-Christian Scientist” and if possible, a link to this site. Authors of posts on the blog retain copyright over their contribution(s). Images may not be shared or reproduced (except in re-blogs) without permission. Comments and healthy debate are welcome! Please be aware that all comments require approval before they are posted. Comments that contain excessive profanity, personal attacks on any person, which name specific individuals, spam, or which advocate violence will not be posted. Comments approved for posting will only be removed at the written request of the commenter themselves. Comments do not necessarily reflect the views of the owner of this blog or any guest bloggers. The owner of this website accepts no responsibility for the content or security practices of any websites or other blogs linked within this website. Links are provided for reference or informational purposes only, and do not imply any endorsement of the website or blog by the owner of this website. Links to purchase books or other items from Amazon or other vendors are provided for convenience only. The Ex-Christian Scientist does not endorse any particular vendor, nor do we receive any payment or other compensation from any vendor. Any images or photographs that appear on this website are credited to their source (if known), except for images created by the editors of this site. If an image has been incorrectly attributed, or used incorrectly or without the copyright holder’s permission, please inform the owner of this blog via e-mail, and the image will be removed immediately, or desired corrections will be made. All views expressed in this website belong to its owner, unless otherwise stated. All views expressed in posts on the blog and forum belong solely to the writers themselves, and do not necessarily reflect the views of the owner of this website. All views expressed in any comments belong exclusively to the commenters themselves and do not necessarily reflect the views of the owner of this website. 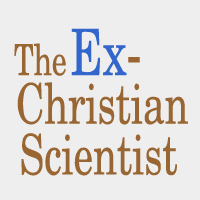 ExChristianScience.com is a participant in the Amazon Services LLC Associates Program, an affiliate advertising program designed to provide a means for sites to earn advertising fees by advertising and linking to Amazon.com, affiliated links will be noted when used.